This is a delicious way of serving an extra stuffing. 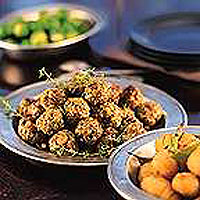 Forcemeat balls can be prepared in advance, then finished off in the oven as the turkey roasts. Melt the butter in a small pan, add the onion and garlic and fry for about 4-5 minutes until soft. Finely chop the parsley in the food processor. Add the bacon and chop it with a few short bursts. Add the pork, egg, lemon zest, thyme, the buttery onions and seasoning. Briefly process so that the mixture is well mixed. Turn into a bowl and stir in the pistachio nuts and chestnuts. Check the seasoning by frying off a small patty of the stuffing until browned. Taste and adjust if necessary. Then neatly roll out 40 walnut-sized balls. Frequently rinse your hands in cold water to stop the mixture sticking to them. Pour the oil into a large frying pan and set over a medium heat. Gently fry the balls in batches until they are lightly coloured. Arrange them in a single layer on a small non-stick baking tray. Once cool, cover the tray and, if preparing the stuffing in advance, freeze until needed. Defrost fully before cooking. Preheat the oven to 200°C, gas mark 6. Roast for 10 minutes or until thoroughly cooked and the juices run clear.